Before either Native Americans or white settlers moved into eastern Washington, a series of ice age floods, starting about 15,000 years ago drove miles of rushing flood waters from Montana through Idaho, eastern Washington, and down the Columbia River to the Pacific Ocean. These rushing waters scoured out hundreds of miles of soil, leaving interesting land formations and basaltic rock formations. The basalt rock is a result of previous volcanic activity when, over a period of millions of years, as many as 300 individual lava flows came through central Washington. This part of Washington is a land of stark contrasts. If you travel south and west of Spokane you will see rolling hills with an occasional rock formation. These hills are mostly planted with wheat. Traveling south from Spokane heading for the Palouse area you will see the same rolling hills planted with wheat. When you go southwest from Palouse towards the town of Colfax you will drop down into the Snake River Canyon, which is almost 2,000 feet deep. There are tours of the Snake River with expert river guides. At Colfax, the Palouse River flows into the Snake. North of the confluence of the Snake and Palouse rivers is Palouse Falls State Park. 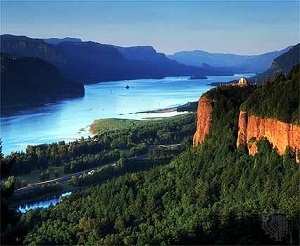 Driving southwest from the state park you will arrive in the Tri-Cities (the cities of Richland, Pasco, and Kennewick). Southeast of Kennewick is the Wallula Gap. Because of the narrowness of the gap on the Columbia River the ice age flood waters backed up forming a lake up to 1,220 feet deep. There are hiking trails at Wallula Gap and the nearby Three Sisters. As you drive along highway 17 going northwest you find yourself in an area called the Potholes Reservoir. This area was formed by flood waters washing out basins in the softer basalt rocks. Now the area is a prime recreational destination for fishing and in some areas bird hunting. This is also a prime agricultural region with some of the crops being onions, potatoes, corn, mint, and wheat. As you drive through on a nice day take the time to roll your window down and breathe in the fragrant smells. If they are irrigating mint the air will have this wonderfully refreshing smell. The air is almost always scented with the farmland and depending on the nature of most harvests, the air will attain that specific smell. There are areas that look harsh and bleak, but if you look closely there are a multitude of flowers, bushes, and grasses. The Columbia Basin is classified as a shrub-steppe, which means that there are at least 300 days of sunshine with low amounts of precipitation. The shrub steppes are rapidly disappearing grasslands that range from Canada through eastern Washington, Oregon, Northern California, Nevada, Utah, southern Idaho, Montana, and Wyoming. Along with the grasses one of the predominant plants is the sagebrush. This is a fragrant plant that can grow from 4-10 feet in height and can live 40-50 years with some living for 100 years. There are three different species of sagebrush native to the shrub-steppes. Most of the native grasses are what are called “bunch grasses”. This means that they do not spread out like the grass on your lawn. They also do most of their growing in the fall, spring, and early summer when there is precipitation. The grasses provide food and habitat for animals and insects. The flowers native to this region are to numerous to name, but each one is beautiful in its own way. There are 42 mammals, 3 lizards, 6 snakes, plus turtles, toads and frogs that ate native to this area. There are numerous birds, some migratory, and insects. You may have to look hard to find any of these. All of these plants and animals have adapted to the harsh climate here. There is low precipitation, high temperatures in the summer and freezing temperatures in the winter.